I saw a patient a couple of years ago who was driving with his window down when an insect flew directly into his eye, lodging itself under his upper eyelid. He attempted to remove it by rubbing his eye and then irrigating with tap water, but he was unable to dislodge the bug. When he arrived at my office, he was in significant pain. He felt quite a bit better after I used numbing drops – known as tetracain – in his eye, and I was able to completely remove the insect from under his upper lid. I then placed an orange stain called flourescein in his eye and viewed in a darkened exam room with the use of a Woods Lamp. With the help of the orange stain, the black light emitted by the Woods Lamp immediately revealed a small scratch in his cornea. This probably occurred when the patient rubbed his eye with a foreign body (in this case the insect) lodged in his eyelid. The resulting abrasion was quite painful. 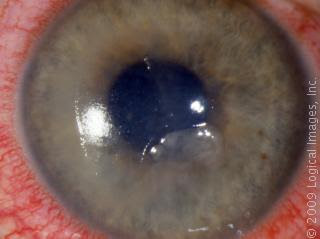 A corneal abrasion is a scratch of the membrane covering the iris. It is usually very painful, but fortunately, it heals quickly – usually within 1 to 2 days. Physicians usually treat these with antibiotic eye drops and provide the patient medication for pain relief while the abrasion heals. If you feel that you have a corneal abrasion, contact your physician for an office exam; it is important to identify as soon as possible. If this description does not match your symptoms, you may find more information in my article What You Need to Know About the Red Eye.